This quick "Pick Me Up" facial is perfect for when you need to just revitalize the skin before that big meeting or before heading out for an evening on the town. 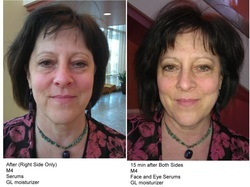 This is a wonderful way to get a quick, gentle introduction to daily facial care. We use products from The Dead Sea - gluten free, animal product free, Dead Sea Salt and Mineral Rich etc. Our Dead Sea line is available as part of our Omsho Spa Parties! So your face, decollete and hands are in for a treat! You skin will be nourished, tightened and hydrated and leave you feeling refreshed! Take the Refresher and add either the Mineral Rich Mud Mask (MRMM) or the M4 or BOTH! 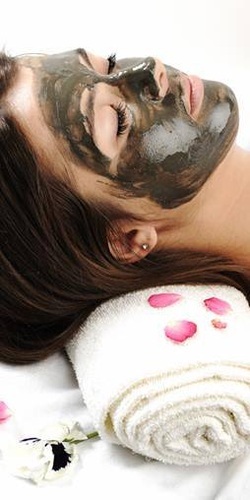 The Mud Mask can be used for all skin types weekly, but is amazing for oily or acne prone skin. Also excellent for spot treatments of the face, neck or body for those occasional breakouts or bug bites. The M4 is our Magnetic Mud Mask - Dead Sea Mud, raw form iron and V5 Essential Oil complex for dermal muscle relaxation. 8 Hours of Sleep in a jar! Fabulous for reducing puffy or dark under eyes and smoothing the creasing of "smokers lips". Redefine your age! 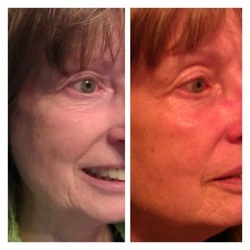 3 months of using the Seacret Age Defy Regimen including Recover. Recommended for those over 40 to delay the aging process - for those over 40 to fight it - for those over 90 to turn it back on it's heels! 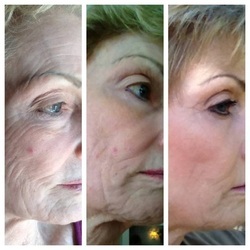 :)This "Age Reversal" facial is perfect for when you need to do more than just revitalize the skin. While this is an outstanding treat before that big meeting or before heading out for an evening on the town, the full effects will be seen in 12-24 hours..Treatment includes the following as a general guide:mild cleansing milk, alcohol free toner, eye and facial Serums to help restore collagen, Moisturizers,M4 anti-aging Treatment (this treatment alone sells for $500 elsewhere) with essential oils. Add a facial mud mask during a full wrap for just $25! Cleanse, Tone, Detox, Tighten your whole body in one fel swoop! This wrap is available for IN HOME ONLY so we have shower access. We use the best body mud/silt by Seacret - direct from the shores of the Dead Sea. Applied evenly from the shoulders/neck down to the knees - you are then wrapped in cellophane to enhance the heat, wrapped in a sheet and blanket, and pampered for 20 minutes on our comfy massage table with a head massage. Then you are unbundled and the mud is allowed to dry to finish the detoxification pull. You're then wisked into the shower for a dry sluff of all the dead stuff - and then washed. Then Salt & Oil scrub is used to buff and polish all of you! Then it's back to the table for an application of Seacret Body Butter all over! The Perfect Pamper time! SEACRET - A short Informative Video Featuring...WOW Parties from SEACRET Official on Vimeo. SEACRET Preferred Customer Program from SEACRET Official on Vimeo.